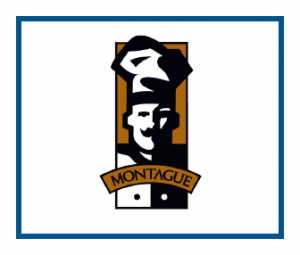 Convection ovens have been used in restaurant kitchens, hospital kitchens and many other locations since the early 50s and traditional static ovens were being used even before that. Combis came about in the 60s to help end users with the convenience of having the capability to use steam heat and dry, convection heat in the same piece of equipment. Other types of ovens exist as well (microwaves, conveyors, etc. ), but there hasn’t been a major innovation in the industry in about 50 years. Thanks to the Vector Multi-Cook Oven from Alto-Shaam, that is no longer the case. 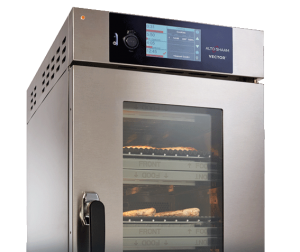 The Vector oven, unveiled by Alto-Shaam in 2017, works differently than any other oven that’s been on the market before. First, the Vector can have up to four individually sealed cooking chambers which can all be set to different temps, fan speeds, and cook times, which gives users the ability to cook four different food items simultaneously without any waiting or flavor transfer between products. 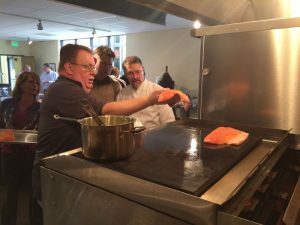 Users can cook salmon, chicken, biscuits, and cookies all at the same time and not have to worry about their cookies tasting “fishy.” Also, each chamber on the Vector can be set within a 100-degree difference of the adjacent chambers. The bottom chamber could cook at 350 and the next chamber up could cook at 450 with no problem. Second, the Vector uses new Structured Air Technology, which allows for a more efficient heat exchange during the cook resulting in a cleaner, more even cook of any product you put into it. To go into a little more detail, a fan at the back of each chamber splits the air between the top and bottom of the chamber, which is then pushed through a plenum (which is what is used in conveyor ovens to create the impinged air that cooks the food). Where the Vector differs from a conveyor oven is in the design of the plenum. While a conveyor oven’s air is pushed through holes that are randomly scattered across the plenum and it cooks the food while the food slowly moves through the oven, which sometimes results in the food having darker spots on its surfaces, the Vector’s air is pushed through a patterned series of dots and dashes so that the food gets evenly cooked throughout and spotting is avoided altogether. The fan that is blowing this air through the chamber serves a dual purpose in the sense that it is also pulling the air back as well. This keeps the heat inside the oven and guarantees that not only is the oven’s door safe to touch from the outside, but also that the heat does not escape the oven when the door is opened to pull product out/put product in. If the door is open for a little longer than normal, the Vector will automatically add the time needed to compensate for the lost heat. Another perk of the Vector is that the half size model is ventless, meaning it does not need to be placed underneath a vent hood. If you’ve ever had to purchase a hood, then you’ll know why this is a plus. One of the biggest advantages of the Vector is that it cuts total cook time down exponentially. 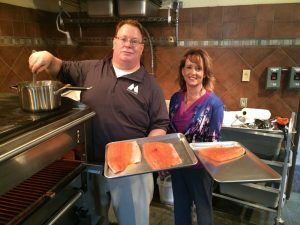 Miller & Associates’ Culinary Training Chef Tug Toler sheds some light on this. While other factories make ovens that could be considered competitors to the Vector, such as TurboChef’s Double Batch or Ovention’s MiLO, they are not necessarily comparable to the Vector. 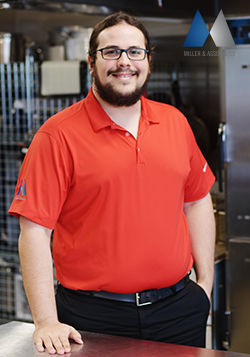 Toler explains why the Vector is a preferable alternative to other speed-type ovens. 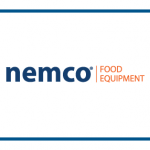 Dealers and end users who purchase the Vector also have the bonus of Alto-Shaam’s large network of training chefs and culinary support specialists. 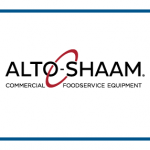 Each territory has at least one Alto-Shaam certified chef that is available to help in training and setting up the Vector (as well as Alto-Shaam’s many other products). No stranger to culinary innovation, Alto-Shaam started from humble beginnings in the early 50s. Founder Jerry Maahs was running a fried chicken business in Wisconsin that did home delivery. After a mishap with a warmer that led to a car fire during a delivery, Maahs decided that there needed to be a safer way to transport the food. This idea led to the creation of Alto-Shaam’s patented Halo Heat technology which hurled them into the food equipment industry. 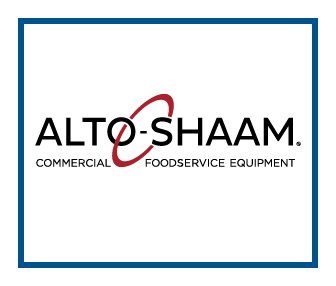 Over 50 years later Alto-Shaam continues to innovate and be a top contender in the food service world. And with rumors of even more ground-breaking equipment on the way, the Vector will be far from the last new-and-improved product Alto-Shaam has to offer. Until said products grace the market, the Vector will continue to be the latest and greatest in cooking innovation. There is a saying in our industry, that I’m pretty certain playfully originated from the manufacturers, “So easy, a rep can screw it up.” In my almost ten years as a manufacturer’s representative (rep), I’ve seen this line come true again and again. And while almost all of us have spent a lot of time in kitchens and dish rooms, it’s not to say me and my fellow sales women and men are inept. We (in the general sense) tend to lack the everyday in and out kitchen knowledge. Pair that with early in our careers, we get sent out into the field to demonstrate (to kitchen professionals) pieces of equipment that we may never have seen in person before. This is usually where the rep will screw it up, demo-ing it wrong, making up a fact/answer, or forcing open pieces that were not meant to be opened. Then the service agent or factory has to come in and fix what the rep broke. Another time we reps screw things up is when the end user is having an issue and the rep thinks he can save the end user a service call. This usually happens just after the early phase in our career. When we have enough knowledge about the product and how it should work to get into trouble. The rep might try to wiggle this here, or remove that there and presto, the rep has made it worse. I poke fun at myself and my fellow industry sales reps to help illustrate a point. While we know kitchens, and we know how the pieces work, we don’t always have the intimate knowledge that comes from using these pieces of equipment day in and day out. Personally, I’ve worked on the operations side of our business since I was about 16 years. I was a short order cook at a ski lodge in West Point, NY for 3-4 winters. Then later in college, I was a waiter at a couple different restaurants. Once graduated, I didn’t exactly know what I wanted to be. I moved to DFW and started working at a fine dining steakhouse in Plano, called Kirby’s Steakhouse. I worked there for 2 years and was a headwaiter and bartender by the end. I learned a lot about quality steaks, team work, leadership, fine dining, and wine. Watching the chefs and cooks night after night, the number one thing that I was blown away by (and still admire today) was the ability to know different cuts of steaks internal temperature (“doneness”) just by touching it. They never used a thermometer and the certainly NEVER cut the steak to check doneness. At Kirby’s Steakhouse they used an underfired charbroiler to grill the steaks, seafood, and chicken. The really good grill station chefs could tell the difference between a medium rare and a medium with just using their tongs to “squeeze” the meat. That is the difference of a few degrees , where the steaks’ color turns from a warm red center to a hot pink center. Imagine how much time and training it took the chefs that worked the charbroiler to know the charbroiler’s hot and cold spots. To feel the difference between rare and medium rare just by pushing on it, knowing that if they over cooked it, a $40-$50 steak would be thrown out and they’d have to start over. Most of us can’t do that great with 2-3 steaks on our grills at home; imagine now adding another 20-30 steaks (of different cuts and sizes) onto the grill all with different temperatures and all put on the grill at different times. Make sure they have even grill marks and aren’t overly charred. It really is mind boggling and very impressive. And once all this is figured out and perfected, as a restaurateur, now you have to worry about that employee leaving or being sick or taking something almost unheard of… a vacation. You can only hope to have that chef/cook for years. This all leads me to the Montague Legend Overfired Broiler (often referred to as a Steakhouse Broiler). It is a mean, and not so lean, protein cooking machine. It uses RADIGLO true infrared radiant heat from the 42,000 BTU/hr cast iron burners with temperatures as high as 1800° F or 982°C . Yes, I just typed one thousand eight hundred degrees Fahrenheit. That 1800° is a little misleading because that is the temperature the ceramic radiant tips reach. 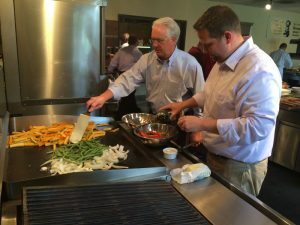 But where the grill grates are, it’s as high as 850°. In comparison, most underfired (traditional) charbroilers commonly reach 600°F on their top end. This increase in penetrating temperature directly correlates to a decrease in cooking time. But where the Montague overfired broiler stands out is the ease of use. You’ll find these in national chains like Ruth’s Chris, fine dining restaurants, countless country clubs, colleges and universities and mom and pop steakhouses. The hurdles and issues with the traditional underfire broilers are the flare ups and the over charring that can occur. They almost all have wide ranges of hot and cold zones. And there is a learning curve that only time, ruined product, and experience can solve. That’s when they told us, Chef Craig would not be cooking us lunch today. But that the 20-25 or so reps in the room would be cooking it ourselves. I drew the duty as the one that would be cooking the steaks on the overfired broiler for team, while others grilled hamburgers on a Legend underfired charbroiler, grilled vegetables on a Legend heavy duty griddle, baked pizza in a Hearth Bake deck oven and baked oven bakeable french fries and pies in the HX convection ovens. I was nervous as to not screw up the high dollar food. We had Chef Craig there for moral support, but he was going to let us leave the nest and fall or fly ourselves. He coached me when I told him of my anxiety, “I promise, it’s 3 minutes on one side and then pull the drawer out, flip them all over and then put the drawer back in for 3 more minutes.” He assured me that I actually had the easy job. And in the end he was right. We have one at our office, please come try it for yourself.